Happy Fashion Friday! Today I would like to share with you a simple, little accessory that I happen to absolutely adore. My hubby gave me one of these awesome bracelets for Christmas last year and I have been clipping it on daily ever since. 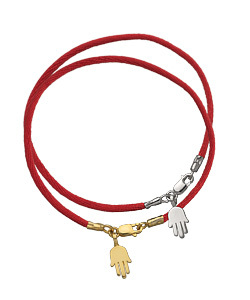 The “One of a Kind Hamsa Hand Bracelet” is said to bring you good luck, positive energy and riches while protecting you from the evil eye. And it looks quite cute doing so! A celeb favorite, this bracelet has been seen on many a starlet strutting her stuff through the streets of Hollywood, keeping her safe from the pesky paparazzi! While I am not sure even this powerful, ancient amulet can repel those persistent photogs, I do appreciate jewelry with symbolism and meaning which is why I am proud to say that I am OMG Obsessed with my One of a Kind Hamsa Hand Bracelet!